This month I had two Student Leadership Seminars for my district, one in Dallas and the other in Mexico City, Mexico. While Dallas was pretty much the same as when I saw it last, there wasn't a lot of sight seeing to be done, however I did get to go visit friends that I hadn't seen in a long time. The Dallas trip was Mashimaro's first drive up to the Metroplex. Yaa Maro! And this trip to Mexico was my first time in Business/First Class - talk about sweeet. Mexico City was a short trip, sadly, but it was a lot of fun. 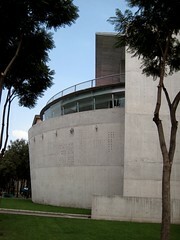 The Mexico City campus of the Instituto Tecnológico y de Estudios Superiores de Monterrey was beautiful and the students were amazing. I was picked up at the airport by a student who drove me to the campus in his red Peugeot 307 CC and got to listen to the latest latin pop music with the top down. The hosting students were very efficient and quite talented. A couple of them performed on stage with their dance troupe for an on-campus engineering festival. The food was generously provided by one of the students' mom. We're talking real, home cooked, delicious mexican food! 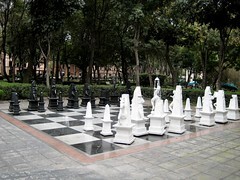 There's a huge chess set on campus. The pieces have rollers so they can be moved around. Each of the pieces represent a piece of Mexico's history. This is the technology building on campus. The inside walls are all glass/plexi-glass. Even the elevator shaft is see-through. It houses just about every engineering and science lab with the latest technology and there's even an RTV and Digital Arts lab! There's this well on campus that collects rainwater that gets pumped to a treatment center to be reused to water the landscaping.